But since you said that all religions by diverse roads and pathways aspire to that one dwelling-place, I fear lest, perchance, while supposing that the way in which you are now found tends there, you should be somewhat reluctant to embrace the way which alone leads men to heaven. Observing, however, more carefully the word which you used, I think that it is not presumptuous for me to expound its meaning somewhat differently; for you did not say that all religions by diverse roads and pathways reach heaven, or reveal, or find, or enter, or secure that blessed land, but by saying in a phrase deliberately weighed and chosen that all religions aspire to it, you have indicated, not the fruition, but the desire of heaven as common to all religions. You have in these words neither shut out the one religion which is true, nor admitted other religions which are false; for certainly the way which brings us to the goal aspires thitherward, but not every way which aspires thitherward brings us to the place wherein all who are brought there are unquestionably blessed. Now we all wish, that is, we aspire, to be blessed; but we cannot all achieve what we wish, that is, we do not all obtain what we aspire to. That man, therefore, obtains heaven who walks in the way which not only aspires thitherward, but actually brings him there, separating himself from others who keep to the ways which aspire heavenward without finally reaching heaven. For there would be no wandering if men were content to aspire to nothing, or if the truth which men aspire to were obtained. If, however, in using the expression diverse ways, you meant me not to understand contrary ways, but different ways, in the sense in which we speak of diverse precepts, which all tend to build up a holy life — one enjoining chastity, another patience or faith or mercy, and the like — in roads and pathways which are only in this sense diverse, that country is not only aspired unto but actually found. For in Holy Scripture we read both of ways and of a way — of ways, e.g. in the words, I will teach transgressors Your ways, and sinners shall be converted unto You; of a way, e.g. in the prayer, Teach me Your way, O Lord; I will walk in Your truth. Those ways and this way are not different; but in one way are comprehended all those of which in another place the Holy Scripture says, All the ways of the Lord are mercy and truth. The careful study of these ways furnishes theme for a long discourse, and for most delightful meditation; but this I shall defer to another time if it be required In the meantime, however — and this, I think, may suffice in the present reply to your Excellency — seeing that Christ has said, I am the way, John 14:6 it is in Him that mercy and truth are to be sought: if we seek these in any other way, we must go astray, following a path which aspires to the true goal, but does not lead men there. Athanasius on LSN: 20th Century Popes “abused their power by implementing radical and inorganic liturgical reforms”. 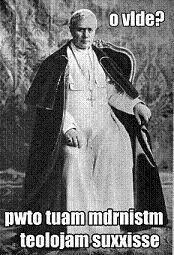 …the auxiliary of Astana considers that, far from reflecting an exaggerated ultramontanism, the acceptance of the possibility of a heretical pope but the denial that he could be deposed reflects a reasoned and proportionate understanding of papal authority. Bishop Athanasius Schneider has published a very interesting piece at Rorate about the impossibility of deposing an heretical pope. He may or may not be right in theory but that very fact of uncertainty probably demonstrates he is right in practice. Katolicka Etyka Spoleczna is out! Katolicka Etyka Spoleczna which George Weigel has allegedly been desperate to keep from everybody for years has finally been republished! George is upset that people are saying mean things about him. He still maintains the text isn’t really by Karol Wojtyłą. George neither speaks nor reads Polish but he has lots of unfalsifiable anecdotes about JPII so there. 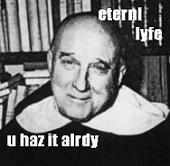 Paul VI born in original sin after all! For he that eateth and drinketh unworthily, eateth and drinketh judgment to himself, not discerning the body of the Lord. Moral Therapeutic Deism is the mainstay of most sermons in rich developed countries, a doctrine which empties the Cross of Christ of its power. Very few Catholics in western countries attend Mass every Sunday (USA 39%). Worryingly many (USA 37%) deny transubstantiation. Add to that those who are for other reasons unable to receive Holy Communion in a state of grace and then consider that almost everyone in a standard Novus Ordo parish receives Communion at every Mass. The present ‘pastoral model’ of a western diocese is constructed to ensure the damnation of the greatest possible number. From a financial and administrative point of view the model is obviously unsustainable but it is hard to see from a Christian point of view why one would fear rather than thirst for its demise.